This rich, colorful treat teaches children and parents the roots of a nonviolent faith that inspired Gandhi and MLK. Mahavira: The Hero of Nonviolence is a beautifully illustrated children’s story based upon the life of a teacher of the Jain faith. With lots of bright reds, an illustrative style and child-friendly, simple-to-understand text, this book will enchant children and adults. Mahavira was born a prince in India, but he wanted more in life than being royalty. He wanted more for his soul. He followed Jainism, a religion based on nonviolence and respect for all living things. After obtaining permission from his brother, he left his worldly life behind and lived in the woods as a monk, until he obtained his goal: a pure soul. He went on to teach the Jain beliefs of love, the understanding of the many sides of truth, and separating true needs from wants in life. When he died, “his soul reached moksha. In moksha there is no pain, suffering, or sadness. It is a place of knowledge, happiness, and bliss.” In the joy and happiness of this, Jains have the festival of Diwali on the date of his death. The nonviolent ways of Jainism inspired Gandhi and Martin Luther King Jr.
Demi, the illustrator, has created bright Eastern Art-based illustrations, with pops of gold and red, many rich colors, and designed borders. The outlined images help define the foreground objects on mostly solid color backgrounds. Children will love these eye-catching drawings and choosing their favorite animal or flower image. The cover defines the story well, with the title in script at the top, and Demi’s illustrations of Mahavira and animals below, showing how they are all at peace. A short explanation about Mahavira and Jains is the back copy, with another illustration below. The inside layout has text on the outer edges of the pages, with bordered illustrations on each page, or sometimes a two page spread of the illustration. The author includes on the copyright page a brief description of Jainism, which helps with the understanding of the background of Mahavira. The book as a package is easy to follow and pleasant to look at. 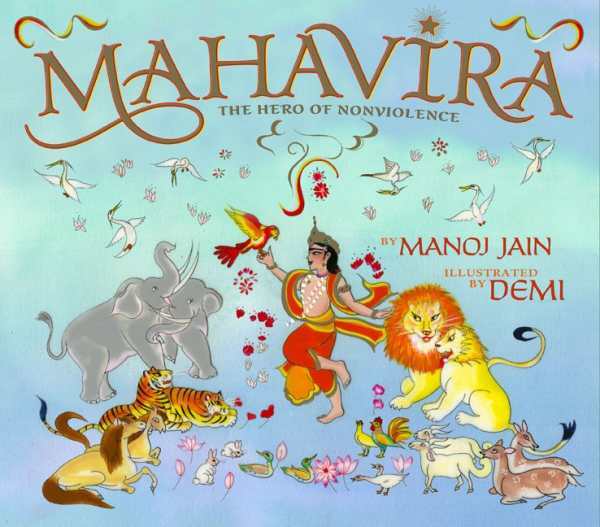 Peaceful and loving, Mahavira: The Hero of Nonviolence, is a gracious book with exquisite illustrations, a strong story, and an important moral of nonviolence.